Got in my 12x24 Cricut mat yesterday so I did a quick test using posterboard cut to the full size of the mat and the Bags, Tags and Boxes cartridge. 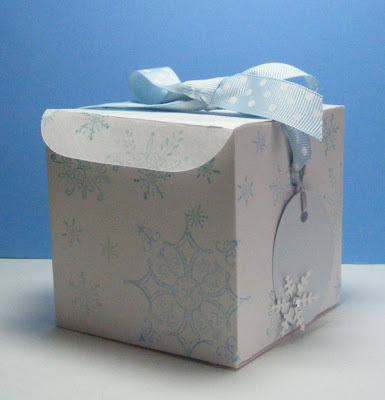 This square box is about 3 1/2" square - a nice size for a Christmas Ornament or a gift of a few cookies. This style of box still did not use the full 24 inch width so I'm still hoping for larger boxes with some of the other layouts. Tip: It always seems to take me several goes to get a halfway decent bow. 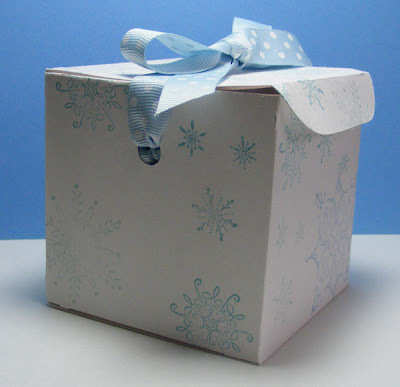 If you want to make up boxes ahead, you can go ahead and tie your bows too. Just leave the bottom of the box unglued so you can slip your treats in that way.